Pascal the Turkish Kangal Dog at 2 years old lives in Turkey. The Kangal Dog is a large, powerful, heavy-boned dog, whose size and proportions have developed naturally as a result of its continued use in Turkey as a guardian against predators. The head is large and moderately wide with drop ears. A properly proportioned Kangal Dog is slightly longer (measured from prosternum to point of buttocks) than tall (measured from the withers to the ground), and length of the front leg (measured from point of elbow to the ground) should equal slightly more than one-half of the dog's height. The tail, which is typically curled, completes the distinctive silhouette. The Kangal Dog has a double coat that is moderately short and quite dense. The Kangal Dog has a black mask and black velvety ears which contrast with a whole-body color which may range from light dun to gray. Honorable scars or other evidences of injury resulting from working in the field are not to be penalized. The typical Kangal Dog is first and foremost a stock guardian dog and possesses a temperament typical of such dogs—alert, territorial and defensive of the domestic animals or the human family to which it has bonded. The Kangal Dog has the strength, the speed and the courage to intercept and confront threats to the flocks of sheep and goats that it guards in both Turkey and the New World. Kangal Dogs prefer to intimidate predators but will take a physical stand and even attack if necessary. Kangal Dogs have an instinctive wariness of strange dogs but are not typically belligerent toward people. They are somewhat reserved with strangers, but loyal and affectionate with family. The objective in training this dog is to achieve pack leader status. It is a natural instinct for a dog to have an order in its pack. When we humans live with dogs, we become their pack. The entire pack cooperates under a single leader. Lines are clearly defined and rules are set. Because adog communicates his displeasure with growling and eventually biting, all other humans MUST be higher up in the order than the dog. The humans must be the ones making the decisions, not the dogs. That is the only way your relationship with your dog can be a complete success. The Kangal Dog is not recommended for apartment life. It is relatively inactive indoors and will do best with at least a large yard. The Kangal Dog is naturally protective, but is more "people oriented" than most other livestock guardian breeds. A well-socialized Kangal Dog is not generally aggressive to people, and especially loves children—but the breed does not recognize property boundaries. It will wander, attack stray dogs, and may be aggressive to human intruders, especially at night. Good fencing is therefore essential. This breed needs exercise and mental stimulation. Working dogs with acreage will exercise themselves by patrolling the property and protecting their livestock. Family dogs need daily walks, jogs or runs and socialization off-property, because if there is no work to do they will not get adequate mental and physical exercise and may become hard to handle. While out on the walk the dog must be made to heel beside or behind the person holding the lead, as in a dog's mind the leader leads the way, and that leader needs to be the human. This breed requires little grooming. The coat needs thorough brushing-out during the twice a year shedding season. You can get away with little attention the rest of the year. The Kangal Dog is a seasonal, heavy shedder. The Turkish people claim: the Kangal Dog is an ancient flock-guarding breed, thought to be related to the early mastiff-type dogs depicted in Assyrian art. The breed is named for the Kangal District of Sivas Province in central Turkey where it probably originated. Although the breed has long been associated with the family of the Aga of Kangal, large landholders and chieftains, the majority are bred by villagers who take great pride in the dogs' ability to guard their flocks of sheep and goats from such traditional predators as the wolf, bear and jackal. The relative isolation of the Sivas-Kangal region has kept the Kangal Dog free of cross-breeding and has resulted in a natural breed of remarkable uniformity in appearance, disposition and behavior. Despite its regional origin, many Turks consider the Kangal Dog as their national dog. Turkish government and academic institutions operate breeding kennels where Kangal Dogs are bred and pedigrees are carefully maintained. 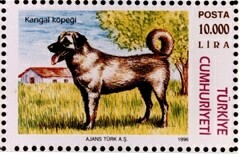 The Kangal Dog has been featured on Turkish postage stamps and coins. The Kangal Dog was first reported in European and North American canine literature by David and Judith Nelson, Americans who studied the dogs while residing in Turkey. The Nelsons imported their first Kangal Dog to the United States in 1985. This dog, and subsequent imports, provided the foundation for the Kangal Dog in the United States. True Kangal Dogs are from the province of Sivas and the town of Kangal. Others claim: the breed was first developed in the west by Charmian Steele and others in Britain. The first Kangals entered England in 1965. The first litter was born in 1967. The breed was called Anatolian (Karrabash) Shepherd Dog. Later, someone brought in a pinto dog from Anatolia and brought strife and division into the club, and a split between the Kangal (Karrabash) breeders and the Anatolian Shepherd Dog breeders. Some people declare all Turkish shepherd's dogs to be one breed, the Anatolian Shepherd, however the true Turkish Kangal Dogs are said to be a separate breed from the generic Turkish shepherd's dog. The export of pure Kangal Dogs from Turkey has been controlled and now is virtually forbidden. The isolated historical conditions of the Sivas-Kangal region have resulted in the development of the Kangal Dog as a distinct breed, which has been declared the National Dog of Turkey and a national treasure. The true Turkish Kangal Dogs are first and foremost still primarily working shepherds. The Kangal Dog Club of America continues to work to ease import restrictions. Imported dogs are considered to be extremely valuable for their potential contribution to the genetic pool in the United States. 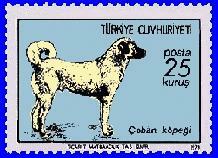 This is a Turkish stamp depicting Turkey's most beloved choban kopegi (shepherd's dog) breed, the Kangal Dog. 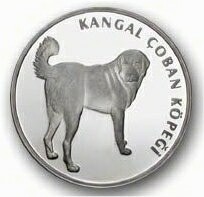 Kangal coin issued by the Turkish government.